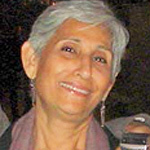 Patel, Usha Nehru is currently Professor and Course leader for Foundation Design Studies at the Pearl Academy of Fashion. In addition to being involved in the pedagogical development of various design programs, she is also a practicing artist whose paintings, drawings as well as fibre and fabric installations have been featured in various galleries, museums and private collections. Further, Usha has also been involved in craft documentation and design development projects focused on traditional crafts and textiles.